A woman driving to her local Walmart heard a funny noise coming from the front end of her car. 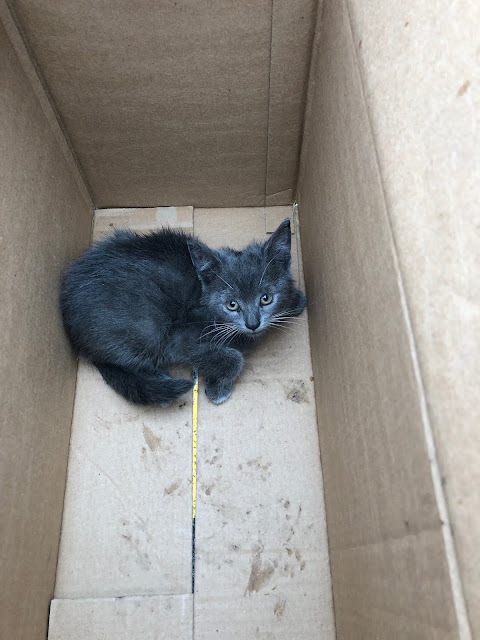 When she arrived in the parking lot on Annapolis Road in Landover Hills she was surprised to find a small kitten had hitched a ride within the fender. Not being able to reach the small kitten she turned to her local firefighter/medics for help. So it was around 8:30 am, Friday, June 22, that she called the nearby Landover Hills Fire/EMS Station 830. It just so happened that the Fire/EMS Department's cat loving Captain was working. Fire Fighter/Medic Captain Danon Ushinski and his wife had adopted a kitten a few months ago that she had rescued. The Ushinski's ended up adopting that rescued kitten "Mystic" after their beloved "Jeffrey" had passed about 2 months ago. Captain Ushinski has since earned the affectionate nickname of the "cat guy." "We drove the engine non emergency to the scene and found a small grey kitten in the fender," explained Ushinski. "With approval of the car owner a decision was made to try and remove the fender for better access." 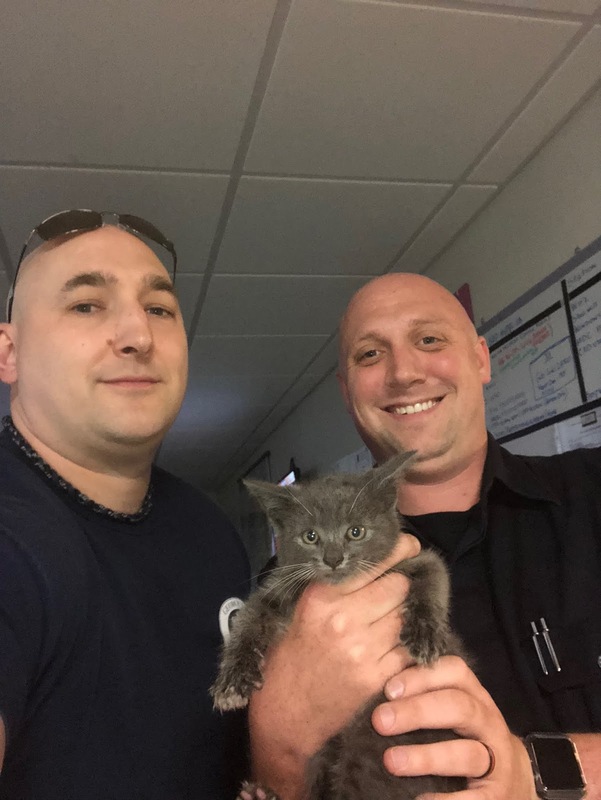 After returning to the Fire/EMS Station to obtain equipment and returning to the scene, Ushinski was able to video the kitten and captured his meowing (video attached). Using some feline type quick thinking, Ushinski replayed the video with the audio of the "meow" combined with the quick cat skill grab of Fire Fighter/Medic Shawn Croissette the vehicle remained intact. Ushinski stated, "I played back his meow and he started meowing and he moved closer to the bottom of the vehicle." Captain Ushinski was joined by "cat guy #2" Croissette. "The kitten moved to a position that Croisette was able to grab him and pull him to freedom," said Ushinski. The kitten was assessed and placed in a box and accompanied the firefighter/medics back to the Landover Hills Station. Plans are for Ushinski to keep the kitten at the station until 3:00 pm. When off-duty he will bring the kitten to the Anne Arundel SPCA. Danon and Morgan Ushinski will go through the adoption process once again of a this rescued kitten the firefighters have named "River." L to R - Fire Fighter/Medic Captain Danon Ushinski, River and Fire Fighter/Medic Shawn Croissette - aka the PGFD Cat Guys with rescued kitten "river"
Medics discovered a dangerous situation this morning when they arrived to treat a 911 caller that felt sick. At around 12:30 am, Wednesday, June 20, an ambulance and a medic unit were dispatched from the Laurel Fire/EMS Station 810 to a townhouse on Pineywood Place after an adult male occupant called 911 and reported he was ill. When the crews entered the home they encountered a male and female occupant, both 70ish years of age, and started their patient assessment. 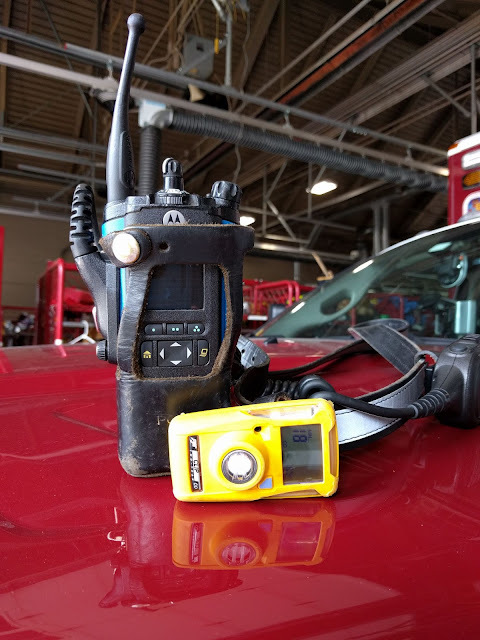 A device attached to the medic’s radio went into alert indicating high levels of carbon monoxide (CO). The ambulance crew and medics immediately knew they were dealing with carbon monoxide exposure to the two occupants. Medics requested additional resources to the scene and evacuated the occupants to the fresh air environment of the homes exterior and started oxygen on both patients. Firefighters arrived quickly and used their monitoring equipment to find there were upwards of 1000 parts per million (ppm) of carbon monoxide inside the townhome. A normal range of CO inside a home can range from 0 to 35 ppm. CO is a byproduct of a fossil fuel after combustion. CO defies all human senses and cannot be seen, smelled, heard or tasted and affects a person after being exposed and inhaling the toxic fumes earning the nickname of the “silent killer”. After the toxic fumes are unknowingly inhaled CO displaces oxygen inside of your lungs and denies the much-needed oxygen to vital organs. Exposures to CO will make a person sick up to being fatal depending on the level of CO and how long you are exposed. The only way to determine the presence of unhealthy CO levels in a home is to have working CO detectors. County Law requires a CO detector on every level of your home if you have natural gas services, a fireplace or an attached garage. CO detectors can be purchased at home improvement, electronic and hardware stores. Both occupants displayed signs and symptoms of CO exposure and were transported to an area hospital with hyperbaric services. A hyperbaric chamber is typically the treatment of choice for patients suffering from CO exposure. Firefighters searched the townhouse for a source of the CO. All natural gas burning appliances and ventilation systems were checked in the house as well as adjoining townhouses. A running auto in the attached garage was found to be the source of the high levels of CO. It appears that the vehicle was left running accidentally. 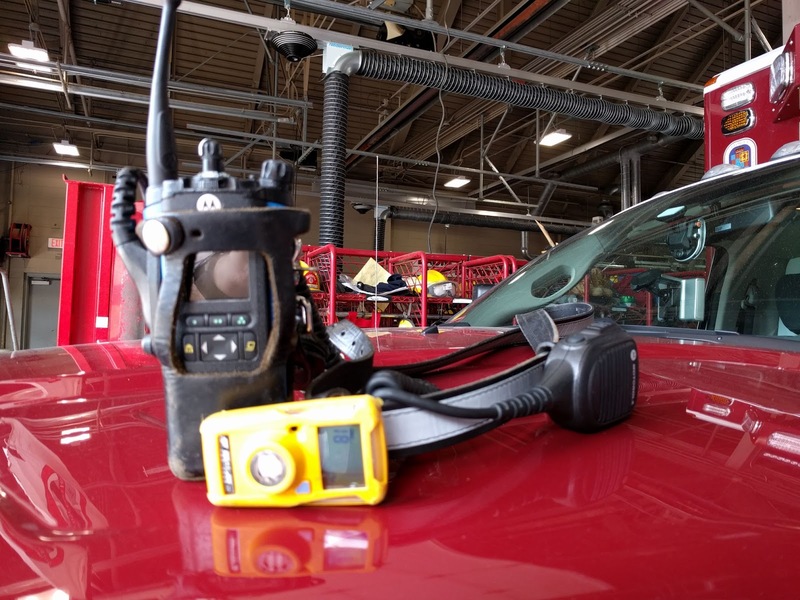 Starting in 2015 all radios assigned to PGFD EMS crews have a portable CO detector attached to it. This will assist EMT’s and Medics to detect the presence of CO when confronted with a situation like today. The rapid detection protects the crews and allows for a faster treatment of the exposure. The yellow device is the portable CO detector attached to medics portable radio. PRINCE GEORGES MD, June, 2018 —The Prince Georges Fire/Emergency Medical Services (EMS) Department has received the American Heart Association’s Mission: Lifeline® EMS Silver Plus Award for implementing quality improvement measures for the treatment of patients who experience severe heart attacks. 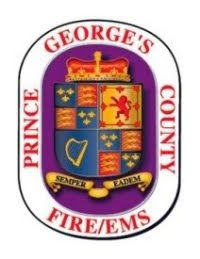 The Prince Georges County Fire/EMS Department is the busiest and largest combination, career and volunteer, Fire/EMS Departments in the Country. 950 career Firefighter/Medics and civilians in addition to 1,200 volunteers protect 500 square miles and nearly 1 million residents through a system of 45 stations that provide a variety of fire, EMS, hazmat and technical services. The Department responds to about 145,000 incidents per year. For citizens and residents of Prince George's County the purchase and use of "backyard" fireworks for the upcoming Fourth of July celebrations may be confusing. It is OK to purchase a Christmas Tree in another jurisdiction and bring home to the County. The same applies for roadside purchases of flowers, fruit, artwork, etc. As County residents travel around the region they will see roadside and parking lot booths set up promoting the sale and use of fireworks in neighboring jurisdictions. Stores sell fireworks also. You may ask whats up?? Over the past several years, during the July 4th week, there has been two significant injuries, this one in Capitol Heights and this one in District Heights. No significant property damage in Prince George's County were documented from fireworks. Our fireworks law is a law we can live with!!! If you have purchased your own backyard fireworks and were not aware of the County Law, call 301-583-2200 and request a Fire Investigator to come by your residence to confiscate them. You will not be charged with a crime if you use this method of surrendering fireworks. 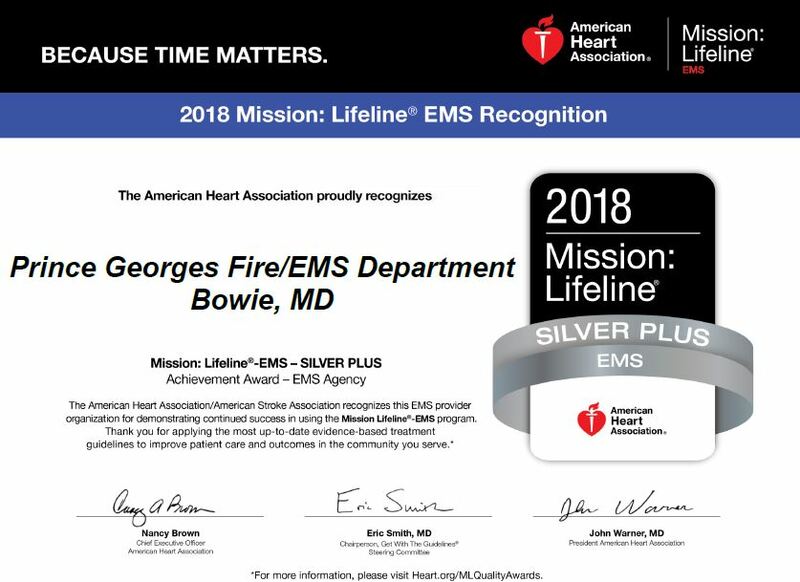 With high heat and humidity upon us in Prince George’s County the men and women of your Fire/EMS Department want you to stay informed and take precautions to stay safe and healthy. Temperatures in the nineties, combined with high humidity may create a dangerous situation for children, the elderly, and those who suffer from chronic heart or lung conditions, primarily, however, everyone can be exposed to unhealthy conditions if precautions are nor followed. Stay in an air conditioned environment and drink plenty of water!!! Remember to check on neighbors, particularly, our senior citizens that may not have air conditioning or choose not to run the cool air due to being on limited incomes. Being in a home without air conditioning in these temperatures is unhealthy and dangerous!!! Don't forget our pets. Keep them indoors in an air conditioned environment and have plenty of water available for them to drink as well. Remember if the sidewalk and road are hot to he touch of the back of your hand - its too hot for a pets paws. Any heat related illnesses will require a victim to be removed from the hot environment in an air-conditioned or cool/shaded area. Heat exhaustion is a milder form of heatstroke that may develop due to a combination of several days with high temperatures and dehydration in an individual. Signs of heat exhaustion include extreme weakness, muscle cramps, nausea, or headache. Victims may also vomit or faint. Heat exhaustion is treated with plenty of liquids and rest in a cool, shaded area. If the persons condition does not show signs of improvement call 911. Heat exhaustion is a milder form of heatstroke that may develop due to a combination of several days with high temperatures and dehydration in an individual. Signs of heat exhaustion include extreme weakness, muscle cramps, nausea, or headache. Victims may also vomit or faint. Heat exhaustion is treated with plenty of liquids and rest in a cool, shaded area. If the persons condition does not show signs of improvement call 911. Staying in an air conditioned environment and drinking plenty of water is a key to staying healthy during the high heat and humidity!!! Fire/EMS Department Recruiter at 301-883-3164 or at PGFDRecruiter@co.pg.md.us. Have you ever thought about being a firefighter, Emergency Medical Technician (EMT) or a paramedic??? Start your adventure to fulfilling your career dreams by attending the Prince George's County Fire/Emergency Medical Services (EMS) Department “Career and Volunteer Recruitment Expo.” The Recruitment Expo is scheduled for Saturday, June 23, 2018, 9 AM - 3PM, at the Largo Plaza Shopping Center, 10500 Campus Way South, Largo, Maryland 20774. 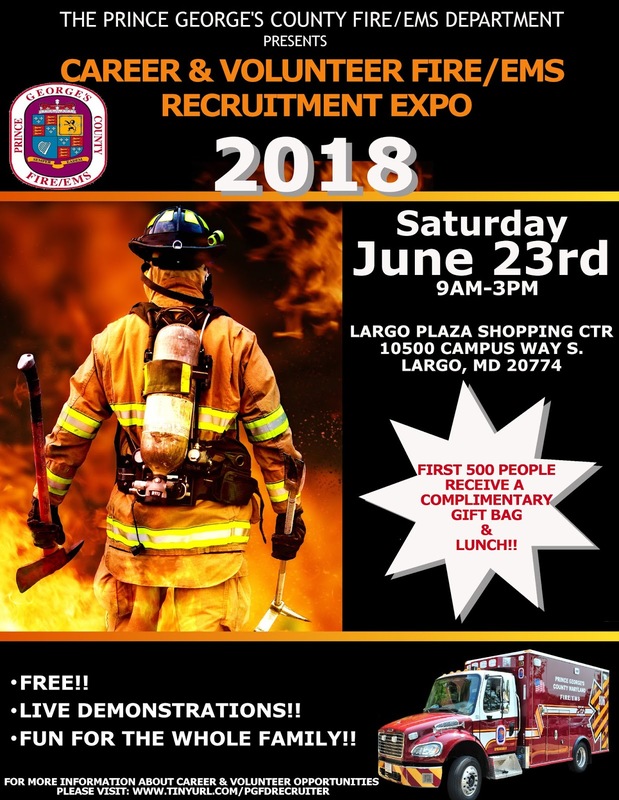 The purpose of the Expo is to serve as a recruitment activity that will attract a pool of diverse individuals to apply for job opportunities within the Fire/EMS Department (career, volunteer, civilian); to involve the community in the recruitment process; and to serve as a community outreach event to provide Fire/EMS informational and educational materials and activities. There will be career, volunteer and civilian members of the Fire/EMS Department on hand to talk about their experiences and answer any questions you may have.